Conductive polymer microspheres, such as gold-coated or nickel poly(methyl methacrylate) beads, are often used in bondline spacer application where conductivity of the metal coating and the ability of the polymer to slightly compress under pressure is desired for a particular application. Conductive polymer spacers are often used in manufacturing of conductive epoxies and adhesives. 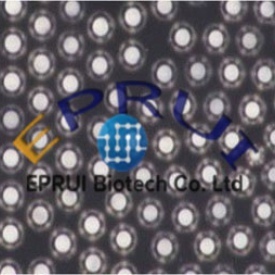 EPRUI mainly have gold coated conductive microspheres and nickel coated microspheres. EPRUI Biotech provides high quality gold plated spacers for microelectronic packaging in electronics manufacturing. With better resolutions and decreasing number of circuit chips or modules in liquid-crystal displays (LCD), the input/output (I/O) density in integrated circuit increases while the size and pitch of the interconnection bumps become very small. Au plated particles are electrically conductive and typically dispersed in a binder to form anisotropic conductive adhesive (ACA) materials such as anisotropic conductive film (ACF) or anisotropic conductive paste (ACP) employed in the connection of microelectrodes. 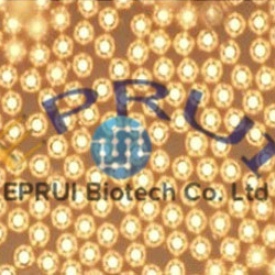 EPRUI Au conductive particles have outstanding size uniformity, high conductivity, appropriate elasticity and strong adhesion between the metal layer and the resin core. Designed specifically for vertical connection of fine-pitch electrodes, Au conductive particles are used, for example, in the interconnect between the two glass panels in the fabrication of LCD cells. EPRUI supplies highly uniform nickel plated particles which has high conductivity and appropriate elasticity. There is also a strong adhesion between the metal layer and the resin core of EPRUI conductive Ni particles. As conductive filler, Nickel conductive spacers are used in coatings, adhesives, printing ink, plastics, and rubber to provide electrical conductivity, electromagnetic shielding, and antistatic resistance in electronics, communication devices, and avionics.